It’s 6:30 a.m. on what is sure to be a hot July day in southwestern Montana as Dean Folkvord gathers his wheat harvest crew to lay out the day’s plan. But this isn’t the normal farm kitchen scene. As Folkvord talks fields, maintenance, and trucking, one of his right-hand-men, Wayne Fuller, nods along with a hairnet crowned head — a lid as commonplace to him, the head maintenance man for the Wheat Montana farm, flour mill, and bakery, as a seed cap is to other farmers. 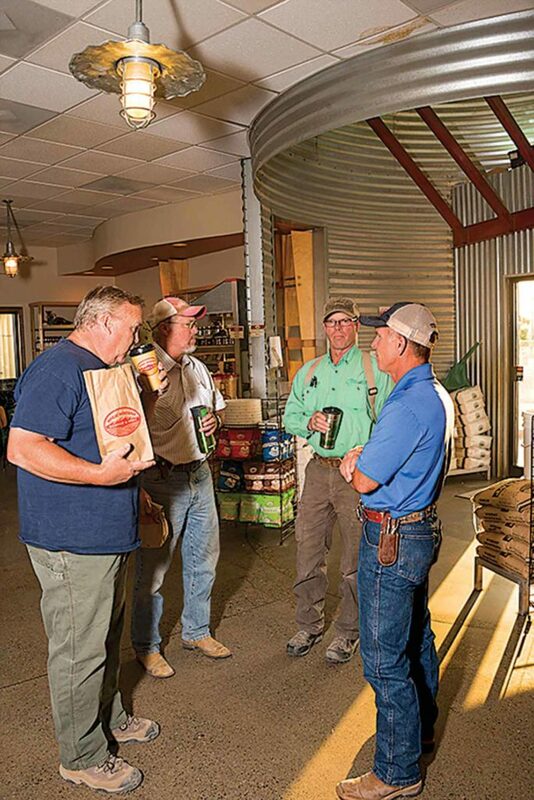 All the while a steady stream of customers pour in the door, pass through the grain bin entryway and weave around the work boot-clad group as they make their way to the Wheat Montana Deli counter. Each walks off with a hot cup of coffee and a baked good made of wheat harvested from the very fields the crew is headed for this morning. Every gooey caramel roll, flaky scone, and slice of bread not only comes from wheat planted, grown, and harvested on Folkvord’s farm, but also cleaned, milled, and baked in the industrial-sized facility glimpsed every time someone passes through the swinging doors at the back of the farm-to-table deli. Combines cut a pass through one of Wheat Montana’s vast golden fields. Once a simple hardscrabble wheat farm where Folkvord’s parents tried to scratch out a living growing grain with just 11½ to 12½ inches of moisture each year, Folkvord and his wife, Hope, have spent the last three decades molding the farm into a business that sells $35 million in products each year with the goal of achieving $55 million soon. The farm has expanded to 15,000 acres where the Folkvords grow heirloom, ancient, and specialty wheat varieties that appeal to bakers and consumers. 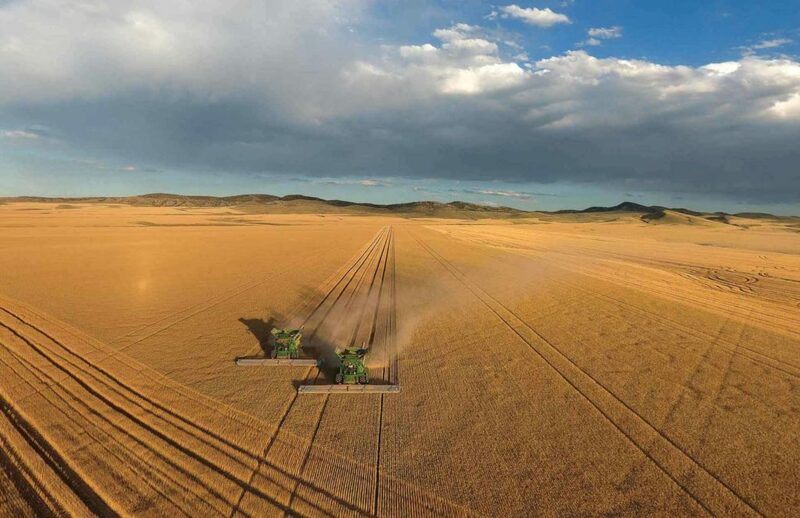 They funnel those grains through a property at the bustling intersection of Interstate 90 and Highway 287 near Three Forks, Montana, and just a few miles south of the farmstead. Grain goes in whole and comes out as a clean bulk wheat, bulk specialty flour, packaged flour, and various fresh and frozen bread products that, depending on the product, ship throughout the United States. The Folkvords made the intersection—-already a major crossroads for the biggest cities in the state—a destination rather than just the turn taken to head to the state capitol. Here they built a commercial flour mill and bakery plus a deli where tourists traversing the state can stop off to buy a “Farmstead” sandwich made with fresh Wheat Montana bread or even a “John Deere Greens” salad. “The deli has been something that really sets our company apart. Growing up, everywhere we went in Montana there was a little cheese factory or a creamery where you could get fresh ice cream, and then all that stuff went away. We came along and tried to recreate the same thing here with wheat. The deli is a place where we can showcase what we do,” he says. Dough is prepped for the ovens. Folkvord shakes his head in wonder at the steady stream of cars rolling through the gas pumps out the deli window. “We initially installed those pumps so we could get a discount on fuel for our farm vehicles. Now it’s a part of the combined draw of the business,” he says. Inside the deli customers can purchase merchandise with the Wheat Montana logo or logos of their various flour brands including flour canisters, mugs, glasses, spoon rests, and more. And then, of course, there’s the loaves of bread, buns, flours, and mixes lining the walls. “Tourists come through here all the time. I can sell a sack of flour that ends up in Connecticut and create a connection with that customer. We sell a ton of stuff with our logo on it. If you can build a business where people will actually buy memorabilia, you’ve got something that’s going to work and going to last,” he says. Of wine and wheat. 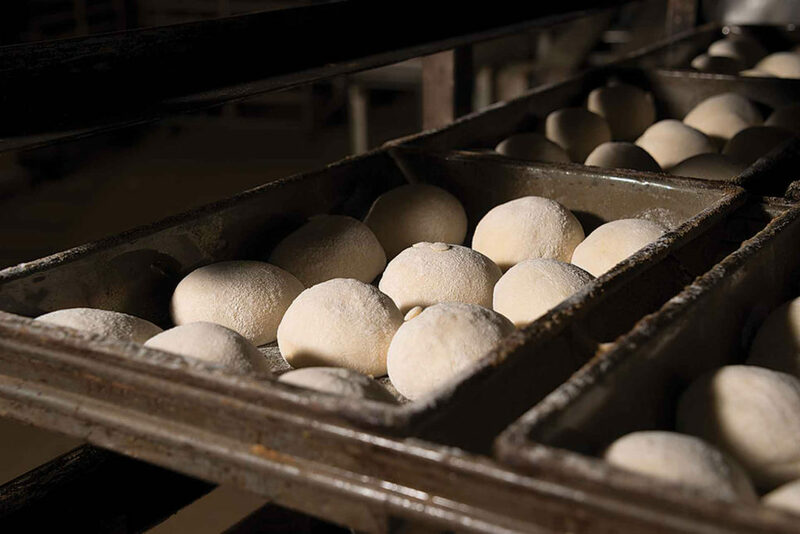 The bakery ovens run day and night and trucks trod endless loops moving product to their customers near and far. “If we had gotten into the grape business we’d be making a product that gets better with age. But we’re in the wheat business. We start with the wheat berries that can last hundreds of years, turn it into flour, which you have 6 months to a year to use, and then turn it into bread you have 6 to 12 days to use. Luckily the value goes up exponentially as you refine the product,” Folkvord says. Storability may go in opposite directions with wheat and grapes, but Folkvord draws parallels between his business and the wine industry. For wine, specific varieties of grapes are used to produce different products. Chardonnay grapes go for Chardonnay wine and produce a different flavor profile depending on the climate and soil where they’re grown. 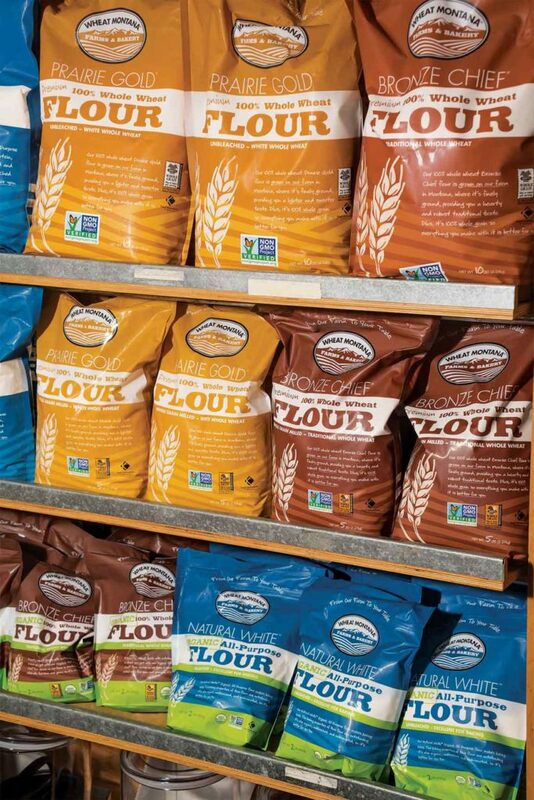 Wheat Montana recently inked a deal with Walmart putting their packaged flour in 2,600 stores nationwide. He admits he’s become a bread snob and can tell at a whiff if bread has been made with Wheat Montana flour, and lacks the chemicals commonly found in most commercial bread. The flavor profile and baking qualities of wheat are highly impacted by its growing environment, and their farm provides unique conditions for wheat that will yield bread to please the pickiest of bakers. “We farm at 4,500 to 5,000 feet, some of the highest farmland in the U.S.,” he explains. “We get hot days and cool nights that stress the plants at certain times of year to make our wheat phenomenally potent. Our silt/loam soils are very basic and highly calcareous [lime rich]. Different areas produce grain with different flavor characteristics and we want to capitalize on that,” he says. He also pays close attention to consumer trends. “Consumers are interested in heirloom grains and ancient grains. We’re growing Emmer, which is one of the 8 original grains grown in the fertile crescent. These grains are 2,000 years old and it’s exciting that we can bring them to the table of Americans -today,” Folkvord says. With interest in heirloom grains at a fever pitch, Folkvord was able to snap up a limited quantity of Rouge De Bordeaux seed, a varietal once coveted by the old bakers of France. The 400-year-old wheat is tall, awnless, and not as agronomically efficient as modern varietals, but bakers will pay a premium for it. They love the story and the flavors of its finished loaves, Folkvord says. It’s not only French bakers the Folkvords go out of their way to please. Once a year Rabbis from New Jersey mount combines, bless, and oversee the harvest of 4 segregated truckloads of wheat. It’s cleaned and packed under their close scrutiny then shipped to bakeries in New Jersey and New York City. This specific wheat turns into the Passover bread for thousands in the U.S. Jewish community. “The Wheat Montana model is one of very few operations that can provide the kind of grow, harvest, pack, and ship requirements of the Jewish tradition,” Folkvord says. Tropical dreams While Folkvord looks to the wine industry for inspiration now, it was pineapples that sprouted the idea of Wheat Montana. Dean and Hope were working off-farm jobs to supplement their farm income, which was a very meager $1,000 per month, and getting nowhere fast. They took a much-debated vacation to Maui during which they toured a pineapple plantation. There were fields of pineapples, a processing facility, and a tasting room and gift shop where they would cut up pineapples, make drinks, or ship a pineapple anywhere in the world. The place was called Pineapple Hawaii. The harvest crew meets at the farm deli for coffee and a bit of breakfast made from wheat they harvested last year. Some bad partnerships along the way threatened the business. They came close to bankruptcy once. “There was a pivotal moment in 1990 when the bakery in Bozeman was losing $5,000 a month and the farm couldn’t cover it anymore. We had to either buy out the partner or be done with it and just go back to farming. We’re bullheaded Norwegians, so we decided to borrow money and stick with the bakery. And thank goodness we did. It’s been awesome,” Folkvord says with a grin that reaches every corner of his face. For Folkvord, that’s still the farm, which he says is an integral part of what they do every day. When he needs to clear his head, his growing crops offer up a form of meditation. “There are three big loops you can take to see the farm, each taking about an hour to drive. My dad and I used to grab a cup of coffee and drive those loops checking the fields and talking about all the things that had happened on this land from when Lewis and Clark passed through to today.” Folkvord lost his dad in 2010, but still makes it a point to drive a loop at least once a week and reflect on where they’ve been, where they’re going and what they need to do.